Good fences really do make good neighbors! So, the fence is up, and I have to say, it has done wonders in quelling my neighbor-related angst. It’s also made having two German Shepherds so much easier (except when they are outside and it starts raining, and we don’t realize it, and they decide to mud wrestle in the garden and then run through the house). Argo has pretty much said, “Hey, it was nice knowing you, but I have a yard. . .” That dog can spend all day lying in the shade sniffing the breeze. He is blissfully happy. Stella, on the other hand, was more excited about all the attention she gets when Argo is outside. If she did go outside, she had to come in to check on me every five minutes. We’ve just been leaving the door open so they can come and go as they please. Then J shut the door and left them outside for about ten minutes the other day, (because they were muddy AGAIN and he was trying to keep them from tracking it through the house AGAIN). Stella was traumatized and has now decided she’d rather just stay indoors, preferably with some part of her touching some part of me at all times. She likes to lie on my feet, or sleep with her head on my lap, or walk so close to me that I trip over her. We’re working on it. I’d be lying if I said that it wasn’t flattering to be needed so much, especially since my other furry confidant has chosen the yard over me, but I know it’s not healthy behavior, and I so desperately want Stella to be a happy, healthy dog. It breaks my heart that she spends so much time in a state of fear. I am so thrilled that my view of The Crap Garden has been narrowed. Although, I suspect Mrs. Gnome has been moving her crap up higher into the trees. In defiance? For my benefit? Just because? Who knows! From the kitchen window, I can see several windsocks, a fake owl, and a gaggle of wind chimes over the top of the fence, but, not having to look at the fake deer, assorted mop handles, and all those bowling balls certainly does wonders for my mood. The weather has been all over the place lately, but Friday was as perfect a day as anyone could ask for. 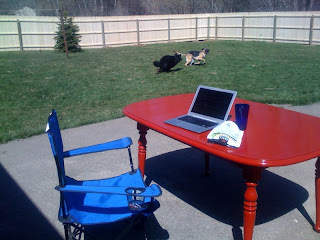 I spent much of it outside working in my new office. And it was lovely.